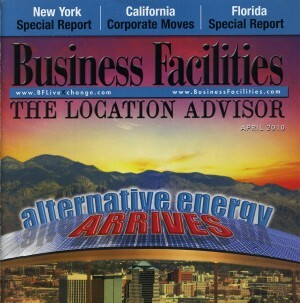 Tucson is featured on the cover of a business publication along with an article highlighting the area’s solar industry. Business Facilities: The Location Advisor calls Tucson “The Solar City” on the cover of its April 2010 edition. “Arizona’s vast desert areas offer the highest solar power potential in America,” the article says. It describes Tucson as the home to “some of the world’s leading photovoltaic manufacturers,” including Schletter Inc., Global Solar Energy and Solon Corp.
Laura Shaw, a spokeswoman with Tucson Regional Economic Opportunities, said her organization was approached by the publication shortly after the announcement that the solar company Bell Independent Power Corp. had come to the area. “The exposure is critical for the fact that the readership for this publication is the target we need to reach,” Shaw said. The magazine is read by consultants who act as site selectors for major corporations, she said. Rob Glaser, an industrial specialist with PICOR Commercial Real Estate Services, said business publications can be one factor that relocation or expansion consultants use when determining the health of a particular industry in a region. Such prominence in a business magazine can verify that Tucson is a legitimate location for alternative energy companies, specifically those that focus on solar, Glaser said. The number of solar companies expressing interest in moving to Tucson has decreased, but that’s the case with most industries during tough economic times, Glaser said. But solar is “one of the top five industries in Tucson that still experiences expansion and growth,” Glaser said. Shaw said many of the companies TREO is currently working with are involved in the solar industry. Tucson stands out from Phoenix, which also benefits from Arizona’s sunshine, primarily in that it already boasts a successful solar cluster, she said. Schletter Inc., a German company that moved to Tucson in 2008, now has 42 full-time employees working at a 70,000-square-foot facility, company spokeswoman Deidre Murphy said in an e-mail. “We looked at locations in Phoenix and Flagstaff, as well as cities in Colorado and California, but we found Tucson most appealing, based on living costs, taxes, competitive operating costs, the business-friendly political climate, as well as shipping costs,” Murphy said. Tucson is recognized globally as a good site for solar companies, she said. “Tucson’s emerging solar industry promises a bright future, and the region has valuable resources for technology development, manufacturing and solar power generation,” Murphy said.